Garbus said there is a darkness lurking beneath her seemingly childish imagery. On a recent Monday night at San Francisco's The Chapel, a packed crowd — all frayed flannel, horn-rimmed glasses, and gender-neutral haircuts — waited patiently for the show to begin. It was a free performance by one of Oakland's most interesting and difficult-to-pin-down musicians, Merrill Garbus, aka tUnE-yArDs. 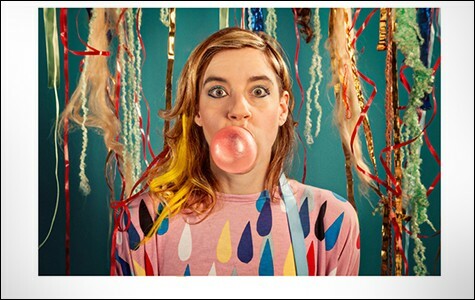 Over the last few years, tUnE-yArDs rocketed into somewhat unexpected success. The band's most recent album, 2011's w h o k i l l, landed on best-of lists around the country, including those of The New York Times, Rolling Stone, and Time magazine. What made tUnE-yArDs' popularity so unlikely was the fact that it offered listeners something stylistically unique — music that fluctuated between simple ukulele strumming and complex syncopation, under Garbus' heavy voice. Perhaps no one was as surprised by this fame as Garbus herself, who seems genuinely nice in a way that risks being considered dull in the posturing world of pop music. Now, tUnE-yArDs has a new album, Nikki Nack, and it's characteristically unpredictable. Garbus — with input from her romantic partner/collaborator, Nate Brenner — has largely left behind the ukulele and looping beats she was known for in favor of a more produced sound, at times jagged and distorted and at others polished like R&B. "I needed to prove to myself that the band could be really three-dimensional and really long-lasting," Garbus said in a phone interview. "That kind of meant getting away from the looping pedal because that had become kind of a shtick." Other than Brenner, all of tUnE-yArDs' bandmembers are new, and for the San Francisco show — which marked the beginning of a short tour opening for Arcade Fire and a longer, headlining one around the United States and Europe over the summer — there was a palpable sense of anticipation on stage. Garbus was dressed in a tight, brightly colored dress that featured a turquoise fish-scale front, cherry-red vinyl fabric, and puffy gold lamé shoulders, and she was clearly excited. She stared out wild-eyed at the crowd as she performed in public for the first time in nearly a year and a half. "This is really fun," she said at one point in an operatic vibrato, glancing back at her new lineup of female musicians: two backup singers and a percussionist, clad in gaudy tribal accessories, colorful sashes, face paint, and sparkly eye makeup. Hearing the new songs performed live was like listening to a giant drum machine orchestrated between four singers, two drumkits, a bass, synthesizers, and an occasional ukulele. Everything is percussive and syncopated, while Garbus' commanding voice floats on top. The album's single, "Water Fountain," swells with percussion and cryptically dark vocals. Garbus has been studying Haitian drumming and dance over the past year in Oakland, and it shows. For Nikki Nack, Garbus said she and Brenner intentionally tried to "push the limits of what we're capable of," which she admitted suddenly felt "terrifying" in light of their arena tour with Arcade Fire. But Garbus didn't want to release another w h o k i l l. "I can't just rehash old things," she said. "I need to really break it down and get better as a singer, get better as a drummer, get better as a songwriter, so that was a lot of what propelled the album." Although w h o k i l l and Nikki Nack are somewhat different instrumentally, there are lyrical similarities. The new album references Oakland, though less consciously than the last one. "Left Behind" is an explosive song about gentrification in San Francisco spreading into Oakland. While Garbus said she loves Oakland and thinks it's "kind of a miraculous place," she also has complicated feelings about it. "Stop That Man" was inspired by the lack of police in Oakland and her fear of being mugged in her neighborhood. "There are difficult things and feelings that Oakland brings up in a really awesome way," she said. Despite the harsh reality that finds its way into her lyrics, Garbus presents her music in an almost overly cute package. In the video for "Water Fountain," painted animations of tribal patterns are paired with images of Garbus and Brenner in a PeeWee's Playhouse-inspired set, dancing with hand puppets, pixelated video game characters, and a giant, fanged, singing couch. It's what you might imagine Garbus, who is 35, would have watched on TV in the Eighties. While the aesthetic adds to the curiousness of tUnE-yArDs' music, Garbus admits it could cause a "tUnE-yArDs backlash" if people only see the surface. She added that there is a darkness lurking beneath the seemingly childish imagery — as with her music, which is a little dissonant. Her inspiration partly comes from the Grimm's fairy tales and the Roald Dahl books she grew up reading. The best children's art, she said, juxtaposes "the cruel parts of human beings that can coexist with joy and goofy dancing" — a feeling that Oakland similarly inspires in her. What defines tUnE-yArDs, she said, "is that little friction rub of maybe some horrible truths that coexist with joy and celebration of life."